Source output : either on or off (see text below). Set the desired frequency in Hz. The frequency range is 0.001 Hz to >1kHz. Place this button on the right. By pressing the push button (s1) on the HVPS enclosure. 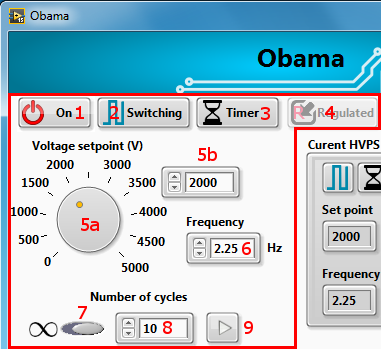 Unlike the two previous methods, the user interface is not aware if a new series of cycles is started using the button. The interface will not change state to reflect that the output is enabled again, but the high voltage LED D3 on the PCB should be blinking again (or be solid red if frequency is high). Consequently, it is recommended that you use one of the two methods above to restart the pulses. However, the button is the only way to restart a series of pulses when the HVPS is used without a computer. While a series of pulses is being made (button (1) is on), pressing on button (1) to turn the output off pauses the generation of pulses (0V at the output). When you press (1) again, the HVPS resumes the burst of pulses where it was paused. You can also press on your keyboard space bar if the interface window has the focus to toggle the state of button (1). If you change the number of pulses in control (8) while the HVPS is producing a burst of pulses, the counter will restart from 0 up to your newly defined value.